This is the first of what I will try to do every Wednesday. I wont try to pretend to review music, instead I will post what I bought on any given week and tell you a little bit about it. The first being We Are Scientist. This is a fast paced and fun album about breaking up, doing stupid things, and then getting fucked up to forget about it. 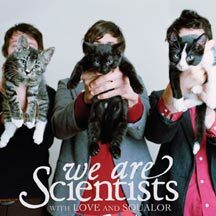 I really like their energy and who doesn't want to buy an album with cute kittens on the cover.